Maxell Vibrabone HP-VBC40 Earbuds Boost The Bass With Bone Conduction | OhGizmo! By Andrew Liszewski on 04/18/11 • Leave a comment! There’s nothing like a good old pair of over-the-ear headphones if you’re looking to really hear the bass from your music. But contrary to popular belief, wearing them outside of a home or studio setting makes you look like an idiot. (Those ‘Beats’ you’re wearing on the subway aren’t fooling anyone into thinking you’re an audiophile.) 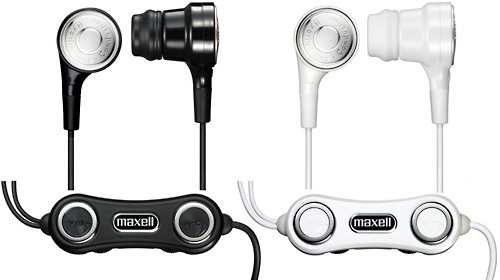 A subtle pair of earbuds are the way to go, and Maxell believes they’ve found another way to boost their bass performance. Their new Vibrabone HP-VBC40 earbuds are a hybrid of standard speaker drivers and vibration-based bone conduction drivers which serve to give your tunes a bit of an extra kick. They’re also a bit safer for your ear drums since the standard technique for boosting bass performance is to simply increase the size of the driver which puts more stress on your inner ear bits. Available in black, blue and white the Vibrabone earbuds also feature a dual inline volume control for adjusting both the overall sound and the bass vibration, and will hit stores on April 25 for a yet to be disclosed price.